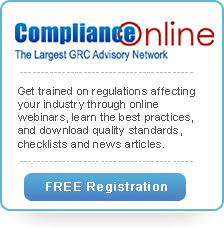 ComplianceOnline, the leading GRC advisory network, and well known FDA regulations expert David Nettleton will conduct a RAPS approved, two day long, in-person seminar on computer system validation, focusing on reducing costs and avoiding 483s. April 26 & 27, 2012 | [New Orleans, LA ComplianceOnline, the leading governance, risk and compliance advisory network with over 500 experts in various regulatory subjects, today announced a comprehensive, RAPS approved seminar on Computer System Validation – Reduce Costs and Avoid 483s. The two day long, in-person seminar, led by well known FDA regulations expert David Nettleton, will be held on April 26 and 27, 2012 in New Orleans, LA. The seminar will train companies in FDA regulated industries on proven techniques for reducing costs associated with implementing, using, and maintaining computer systems in regulated environments. Attendees will learn how to decrease software implementation times and lower costs using a 10-step risk-based approach to computer system validation. As a RAPS-approved seminar, attendees will earn 12 RAC points on completion of the two-day course. David Nettleton, who will be leading the seminar, is an industry leader, author, and teacher for 21 CFR Part 11, Annex 11, HIPAA, software validation, and computer system validation. He is involved with the development, purchase, installation, operation and maintenance of computerized systems used in FDA compliant applications. The interactive 2-day in-person workshop will address the latest computer system industry standards for data security, data transfer, and audit trails. Attendees will learn how 21 CFR Part 11, the FDA regulation pertaining to use of electronic records and signatures, and the HIPAA electronic security regulations for patient medical records fit into the validation process. Mr. Nettleton will review recent FDA inspection trends and discuss on how to streamline SOP authoring, revision, review, and approval. The seminar will benefit anyone who uses computer systems to perform their job functions and is ideal for regulatory, clinical, and IT professionals working in the healthcare, clinical trial, biopharmaceutical, and medical device sectors. ComplianceOnline is a leading provider of regulatory/compliance trainings for companies and professionals in regulated industries. ComplianceOnline has successfully trained over 15,000 professionals from 3,000 companies to comply with the requirements of regulatory agencies ComplianceOnline is headquartered in Palo Alto, California and can be reached at http://www.complianceonline.com.